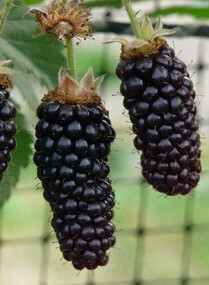 BLACKBERRY, KARAKA BLACK (Rubus fruticosus Karaka Black). Fruit. Enormous, easy-to-pick fruits up to 3ins long, glossy, sweet, juicy, good aromatic flavour. Self-fertile. Plant 3-4ft (90-120cm) apart.